The ISP industry has seen a dramatic increase in the amount of SPAM entering our networks over the past few months. We understand how much of a nuisance this is, in addition to being offensive in many cases, especially for our customers with children. The challenges facing ISP's today in dealing with SPAM are difficult. For each action we take to block SPAM, spammers are one step ahead of us, devising new ways to beat our systems. Spammers share email address databases with each other. This means that once your email address is discovered and entered into ONE database, it does not take long for it to be shared with hundreds of other spammers. When you receive a SPAM message, the minute you open the email (or even preview it in your email client), special codes within the email message are sent back to the spammer, telling them that your email address is valid and working and that you have viewed the message. Originally, it was fairly straightforward dealing with SPAM. You could enter 'keywords' into your email client, and if mail was received with those keywords, you could immediately delete it. Now, spammers know we filter for these words, and devise clever ways to evade the filters, such as using the word "v*i~a*g1r*a" instead of just "v iag ra". The number of ways that any one particular word could be altered to bypass filters is almost endless. Filtering for common words like this has almost become pointless. SPAM filtering like this is called "client-side" filtering. It is often futile, and time-consuming for you to maintain. An alternative is "server-side" filtering, where the ISP implements some new technologies to attempt to catch the SPAM when it arrives at our network. In order to implement server-side SPAM filtering, an ISP must purchase dedicated, high-powered servers to scan every single email message that comes in. This scanning does not only look for tell-tale content within the body of a message, but it also scans the email header -- the part of the message that email servers use to track and route your email message. Within these headers, there are things we can scan for and tests we can run to aid in determining if an email is SPAM. the message is automatically moved to a folder on our email server. folder and delete as you see fit, or use your normal email client in IMAP mode to view the contents of the SPAM folder. delete the message BEFORE delivering it to you. THIS IS NOT RECOMMENDED. SPAM filtering is not 100% accurate. In addition to the probability of SPAM messages still getting through the filters, some non-SPAM messages could get incorrectly tagged as SPAM. This would mean that you would never have the opportunity to review the message since it was deleted before it was delivered to you. You could miss potentially important email. 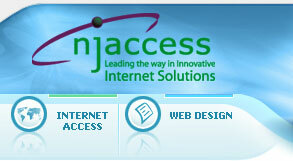 Over the past several weeks, NJAccess has been testing and evaluating several server-side SPAM filtering engines. We had several criteria in our evaluation. First, it had to integrate seamlessly into our existing email server software. Secondly, it needed to be as accurate and reliable as possible. And lastly, it had to be easy for our end users to manage the SPAM mail once it has been identified. 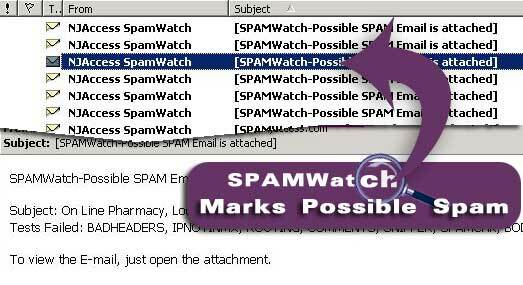 SPAMWatch is offered as a value-added service, but at an affordable price. No changes would need to be made to your email address. 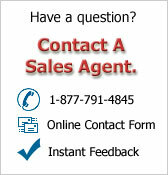 We understand that SPAM has become very frustrating and time-consuming to deal with for our clients. We have received numerous calls from many of you regarding the volume of SPAM being received. We wanted you to know that we HAVE been listening, and have come up with a solution that is affordable for all of our clients.